In the early stages of the American Revolutionary War, General Gage, the British commander in chief in Boston, planned to seize the Charlestown peninsula, but before he could act, on the night of 16th June 1775, Continental troops occupied Breed’s Hill and Bunker Hill and began to build a redoubt on Breed’s Hill. The next day, the presence of the Continental troops was observed by His Majesty’s Ship Lively, which opened fire on the position. With Major General Howe in command, plans were hurriedly put in motion to attack the Continental troops. Howe landed his forces on the southern shore of the peninsular and at once directed his light infantry to attack the section of Continental line along the Mystic River. The light infantry column was repelled with heavy casualties. 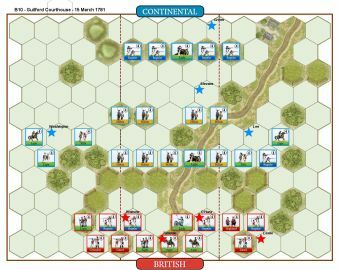 The General then ordered a frontal assault on the redoubt with the main body of troops. It was also repulsed with significant British casualties. 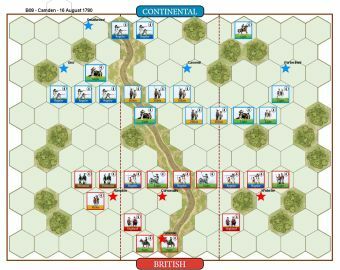 The third attack finally succeeded in capturing the redoubt and the colonists retreated to Cambridge over Bunker Hill, leaving the British in control of the Peninsula. • Opening Cannonade rules are in effect. 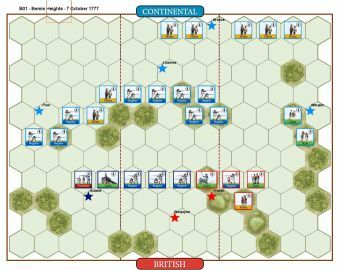 The British player, during the opening cannonade and when playing a Bombard Command card, may fire the ship “Lively” and attack with 1 die against a unit on Breed’s hill or on a unit in Charlestown. 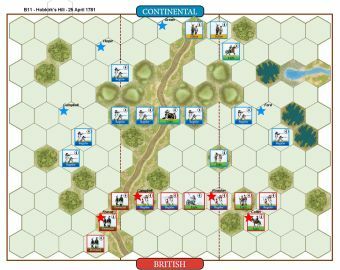 • The British player gains 1 Temporary Victory Banner, at the start of his turn, when there is no Continental units occupying a section of the battlefield. 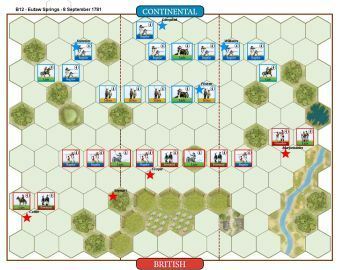 • The British player gains 1 Temporary Victory Banner, at the start of his turn, for each Breed’s hill hex occupied. This scenario is not as one-sided as it looks. 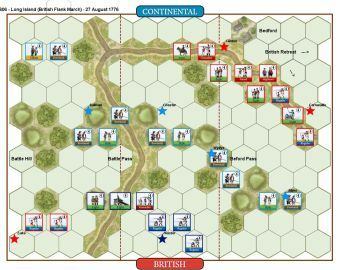 A superb start by the Americans racing to a 4-0 result by decimating the British light infantry attacks and then beating back an all-out attack of the British Regulars. 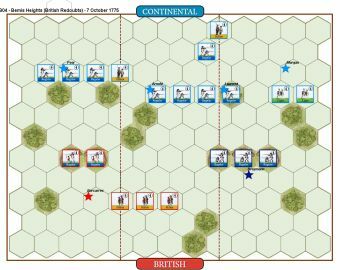 At this stage it wasn't looking too good for the British. 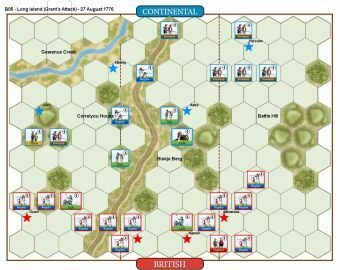 The British managed to rout the Riflemen holding Charlestown to relieve pressure on their right flank plus damage the American artillery. 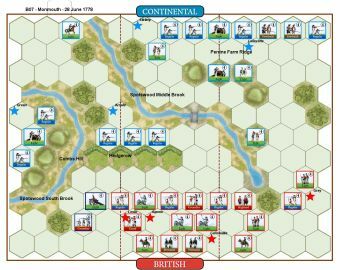 The British looked a bit out of sorts though by this stage and the non-British players were wondering what the British had left up their sleeve. 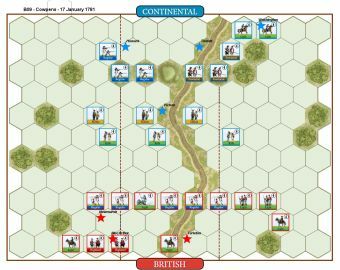 What was up the British sleeve was the "At the Quick Step" card and the grenadiers with General Abercrombie marched straight to the central fence line held by Militia. The Americans were unable to respond in their turn and the grenadiers just tore the Militia apart followed within 2 more turns by the Americans behind the stone wall and the Militia and Riflemen in the centre redoubts. 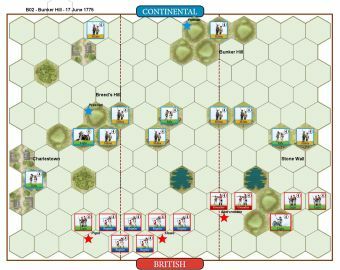 The 4-0 quickly changed to a 4-6 and the British won but not without a mauling. Just another day out for the Grenadiers! So, does the ship has 2 extra dices when playing Bombardment ? 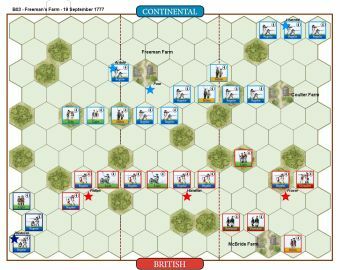 Sorry, it was two victories for the Continentals, not the Brits.